"It is going well. I have visited a lot of the counties and they are aware of my history and my association with the organisation and they know my proven track record working in the GAA, so I am hopeful," says a quietly confident Frank Burke. The track record of which Burke speaks is highly distinguished, having served the GAA at club, county, provincial, and national levels, and currently holding the office of chairman of the National Coaching and Games Development Committee. Burke was also instrumental in the fundraising for and redevelopment of Pearse Stadium. Since announcing his candidacy back in October, the Ardrahan man has been travelling the length and breadth of Ireland, spreading his message. One of the core principles of that message is the place of the club in the GAA. 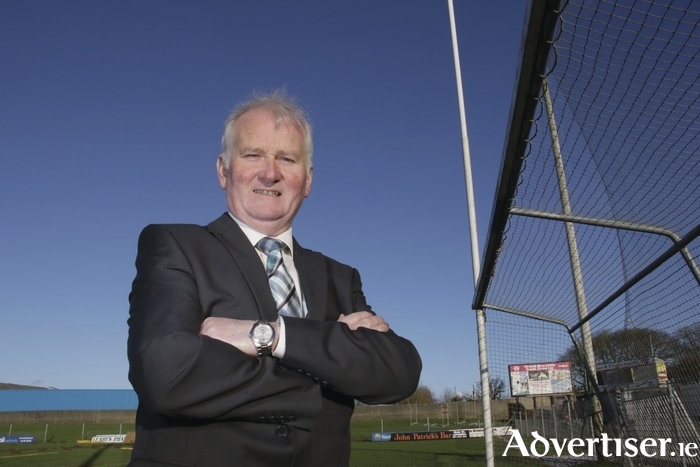 "The club is the essence of the GAA," states Burke. "The club volunteer, I believe, has made the GAA the organisation that it is today and I am determined that we keep that strong volunteer ethos. It is very important that the GAA has enough volunteers and we acknowledge their efforts, because without the work of the volunteers the GAA would be very different to what it is today." One of the most contentious topics in the GAA at present, is the debate between club and county. Burke contends that a balance must be struck between the club and county game, not only to stem the drop-rate of younger players but for players and supporters, at all levels, to enjoy the games. "The club fixture list is of huge significance because at the moment, I believe, the balance is very much geared towards the county, particularly in relation to the preparation of county teams in some counties. The calendar for club fixtures has been dwarfed as a result of this. I believe that is crucial that a specific window is created for club fixtures because the club championship can be completed in a reasonable time period for the club players and supporters to enjoy and not for it to rushed through in the depths of winter. "I also am concerned about the retention of players. In my time as chairman of the National Games Development Committee we have studied this issue over the last number years. The drop off in playing numbers from all levels, particularly ages 13 to 21 has been very high so it is important that there is a meaningful programme of games for players at all levels, from underage right up to adult to keep the interest. We want to give everybody the opportunity to participate and enjoy being a part of the association. I think games are a basic requirement; it is what the GAA is about and that is a priority of mine." According to Burke, one solution to solve this problem is the encouragement of skills based training with the sliotar and football, as opposed to night after night being spent in the gym pumping iron. "Professor Niall Moyna of DCU Health and Human Performance programme has demonstrated the results we wish to achieve for fitness can be obtained via skills based training. At the beginning of January, we had a coaching conference and the major theme that emerged was that there was an appetite for training to be game and skills based. "I believe most training should be done with the hurl and sliotar, or football. It is important that training sessions are enjoyable for players and we should be trying to move away from some of the gruelling and physically demanding training, in particular at underage. Youngsters should be allowed to enjoy the games and enjoy mastering the skills." The schools game is an area of great passion for the Ardrahan man. Burke regards the coaching carried out by teachers after school as not only vital for the development of football and hurling skills, but the reinforcement of general and mental health of children. "The role that teachers have played in developing players at schools level is a major strength of the GAA. In this campaign I have been vocal that, with general health and wellbeing considered for the junior cycle, there should be some Croke Park hours allocated to the games programme in school because there is no better place for character development, team work, and holistic development of a child than games. "I believe the time is right to recognise the wonderful contribution of teachers who have promoted games in schools over the years, and have done so after school hours without renumeration or reward not that they have ever asked for it. If these hours were assigned under games and health and wellbeing then this would be progressive step and it would encourage school leaders to make sure that children are physically and mentally fit. "In some respects, the education system has not risen to this challenge in the past. Professor Moyna spoke recently that children need at least three sessions of fairly rigorous physical activity every week, and if we had that I think body and mind would benefit from it." It is said Ireland's greatest export is its people and whenever an Éireannach shall go, he/she will bring Irish culture. With the thousands over Irish who emigrated to pastures new in recent years, GAA clubs have sprung up all over the world from the United States to Dubai and it is a reality which Burke believes should be celebrated rather than lamented. "[The GAA community overseas] is incredible. The reason why I have been highlighting this throughout the course of the campaign is because I want the clubs at home to realise the tremendous value to their work; especially those coaching juveniles and minors. If these players emigrate, it is felt as a huge loss and it may be tempting to say those coaching efforts have been lost. "But it is wonderful to see the contribution the GAA men and women who have emigrated to their new community. They have done so much good for their new colleagues who arrive from Ireland and for promoting the games overseas. It is important that we appreciate that anytime we lose a player to overseas, the club is making a contribution to the Irish community overseas. Those who have gone voluntary and those who have gone in search of work, it is is important that they settle and they are supported in their new communities. "If elected I will be supporting the GAA clubs overseas, making sure they have whatever that is needed to grow and develop." With February arriving, the GAA season is starting pick up momentum and it will not be too long until Galway hurling supporters cast their eyes to Sunday May 28 and O'Connor Park in Tullamore when the Tribesmen clash with Dublin in the Leinster Senior hurling quarter-final. Galway's hurling seniors have benefitted from their move across the Shannon to the eastern province with the increase in championship action, seeing the Tribesmen come within a hair's breadth of bringing Liam McCarthy home for the first time since 1988. However, for many people, Galway remains at a distinct disadvantage because of the lack of involvement of minor and under 21 teams in Leinster. It is a debate which Burke describes as difficult and a situation where he has huge sympathy for Galway. "The decision was taken at the Galway convention by all of the Galway clubs. They have come to the decision that they must have regular competition and that Galway is at a disadvantage going into the All-Ireland quarter-finals at minor and even more so, at semi-finals in the under 21 competition. I have huge sympathy for the underage teams because you are competing against a team who have come out of a very competitive championship and of all of a sudden you are in an All Ireland semi-final at under 21 undercooked. So I am supportive of Galway's cause. "I hope in the coming months after Congress, the management committee at national level will address the issue, people will approach it in a calm manner, and a resolution will be found and accepted by all." But these questions and decisions will be answered and taken a few months from now and with the announcement only a matter of weeks away you would be forgiven for thinking the Ardrahan man would dreaming about being Uachtarán Chumann Lúthchleas Gael. "I have not been, to be honest. All my energies and dreams have been focused on securing enough support. The GAA presidency is a huge position in Irish sport. We are the largest youth organisation and the largest membership in terms of sports organisation. I think the association has a very special place in Irish society. It is part of our identity and the person who is Uachtarán has to represent and project that identity in the best possible manner. "I feel I am up for it. I believe I have the skills and capacity to do it and I would take it as a honour if it falls my way, but who knows."